Community grant for Murray Districts Aboriginal Association members to revitalise Bindjareb Park. Canning MHR Andrew Hastie, MDAA members Mark Salmon and |Karrie-Anne Kearing, Peel-Harvey Catchment Council project officer |Johanne Garvey and Environment Minister Greg Hunt. MURRAY Districts Aboriginal Association (MDAA) members welcomed a Community Environment Grant, which will help them revitalise Bindjareb Park. Members hope to identify and control threats to the site’s cultural values and threatened species habitat. The Peel-Harvey Catchment Council’s (PHCC) inaugural round of community grants is funded through the Federal Government’s National Landcare Program. Chairman Andy Gulliver said the grants were designed to support local communities to undertake projects which protect and enhance natural assets in accordance with the council’s NRM strategy – Bindjareb Boodja Landscapes 2025 – and the Government’s National Landcare Program objectives. 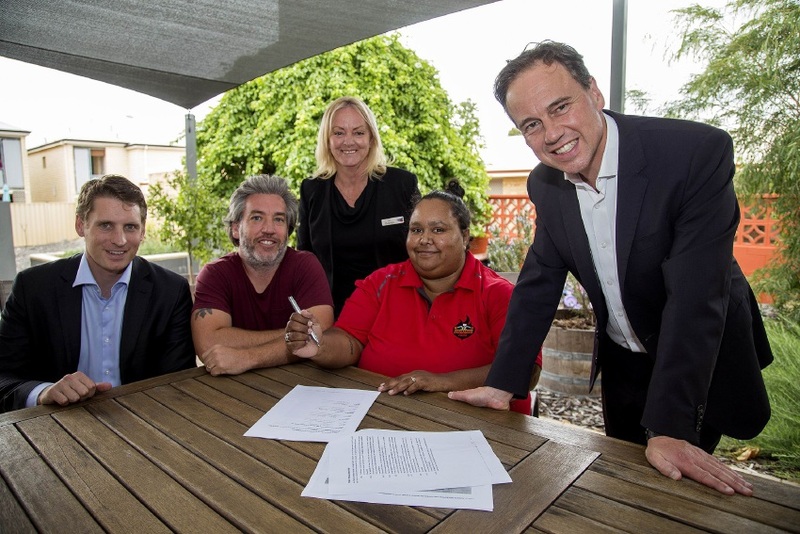 “We are pleased to facilitate Murray Districts Aboriginal Association’s grant for the restoration of the significant Bindjareb Park site,” he said. MDAA spokeswoman Karrie-Anne Kearing said MDAA members were already planning monitoring and site management with project partner the Peel-Harvey Catchment Council. “We are working with the PHCC on workshops to develop an action plan to start on-ground works,” she said. “These will be aimed at improving the habitat and the food for birds like karrak (red-tailed black cockatoos) and clearing the weeds from the park.